News e-senior magazine (in English) NASZE FORUM SenAcT - Seniors Acting Together (wolontariat 50+... LLLE - Learning in Later Life - Europe (Ankara, Is... 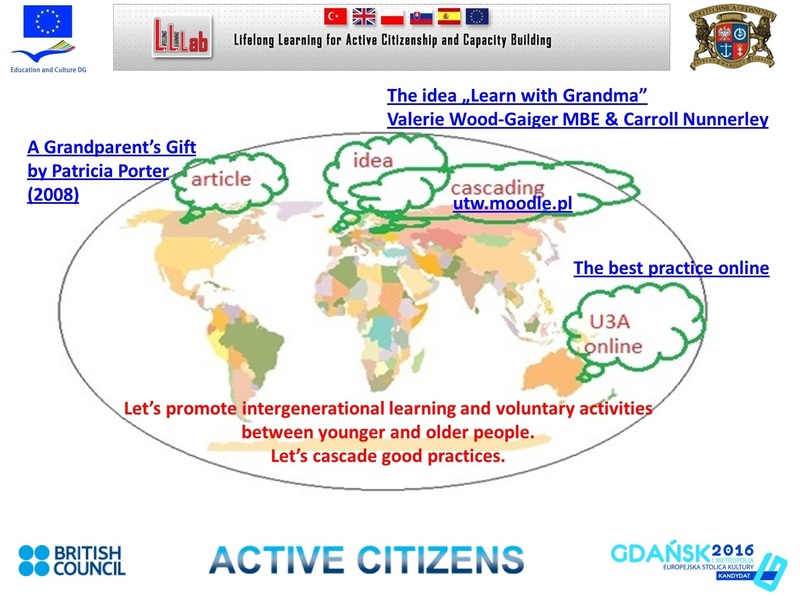 LISTEN - Learning Innovating Styles & Active C... LLLE - Learning in Later Life - Europe (Gdańsk, 16... LLLab (Kosice, 14-17.04.2011 ) Jump to... Connecting +55 (Skurup, 16-20.06.2010) EuBiA (Hamburg, 3-5.05.2010) e-senior magazine Active Citizens - International Study Visit 2014 Projekty partnerskie Grundtviga MATURE - Making Adult Teaching Useful, Relevant a... ForAge for later-life learning: Building on Europe... Learn with Grandma - Gdansk (FB) Senior Acting Together (FB) Let's speak English Gry miejskie - Aktywni 60+ 2014 SenAcT in Gdansk 2013e-edukacja 2013Barcelona-OUC ForAge Program "Uczenie się przez całe życie"
Polish group is looking forward to our meeting in Kosice. We would like to invite you to "Learn with Grandma & Grandpa" project, which is partly supported by British Council. Are interested in? Have you got any questions? The project "Learn with Grandma & Grandpa" seems to be very interesting. Within our project SAGE+ (see http://www.sageplus.eu ) one of our pilot groups has been working on a very similar project aasignmen within the pilot course delivery. Maybe we can share the ideas? Iveta, thank you for your proposal.